6 COLORFUL semi-transparent guitar picks! For now there is no way to allow customers to choose their 6 individual pick colors. Also not all colors are the right thickness. * Comes with a BONUS Bite-the-dust.com Logo guitar pick and for a limited time a free handmade sample pick! Please note that each pack varies color wise. I have many different colors of guitar pick, but some are thinner or thicker than others. The thinner ones are used for jewelry, while the thicker ones are used for playing. 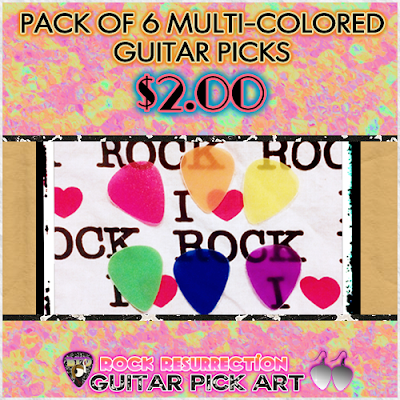 In the case of these picks [because the plan is they'll be usable/playable] I will be sending you the thicker picks. Picks are made from nylon sheeting, polypropylene, acrylic sheeting, styrene, and plastic.